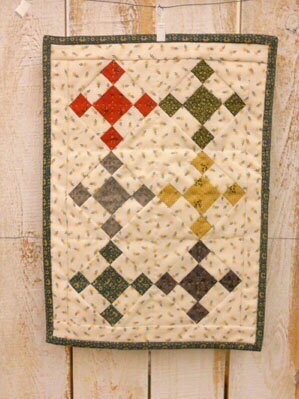 Lemon Bars is just delightful...a shirting background and wonderful little non-traditional 9-patches. All the pieces are pre-cut, just sit down and sew. Kit is complete and packaged in a bakery bag. Along with a "recipe" to make it, this Sweet Confection, is so much fun! 2nd picture is example of packaging. 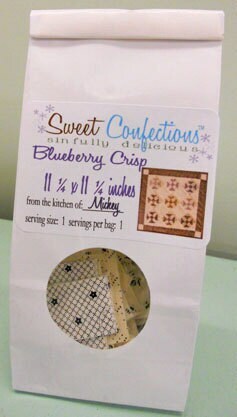 Lemon Bars is 9 ¾ x 11 ¼ inches and a Sweet Confection designed by Mickey Zimmer of Sweetwater Cotton Shoppe.